Piston is a very important part of reciprocating engines, reciprocating pumps, gas compressors and pneumatic cylinders. Piston is the moving component in a cylinder and is made gas-tight by the use of Piston Rings. The Piston Ring is kind of a split ring fitting into a rut of the outer diameter of a piston. 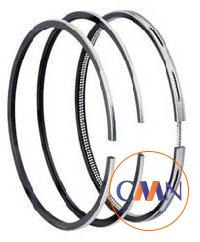 Our Aluminum Piston Ring is highly in demand for its capacity to endure higher thermal and mechanical loads. Piston & Piston Rings are critical to engines for more power, efficiency, and less pollution. We are highly praised for providing great value, top quality and cost effective Piston & Piston Rings that meet all domestic and international customer quality criteria. We are distinguished Piston Rings Exporters. Our products are made out of aluminum alloys and graded closed grained cast irons. Our Piston Rings are known for their durability and sturdiness and also for their availability at reasonable prices.